From fellow painters admiring Jacob van Schalkwyk‘s use of colour and texture to curious high-school students enquiring about what happens with the woodblocks once the full edition of William Kentridge‘s Mantegna (2016, woodcut) is printed. 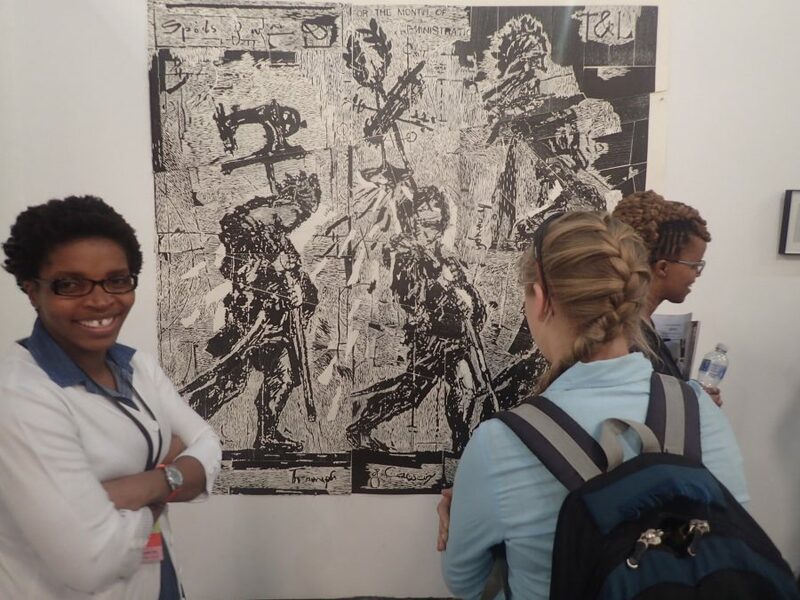 DKW staff member Noma Ngwenya (left) discussing William Kentridge’s, Mantegna, 2016, woodcut (Edition of 12) with a student. 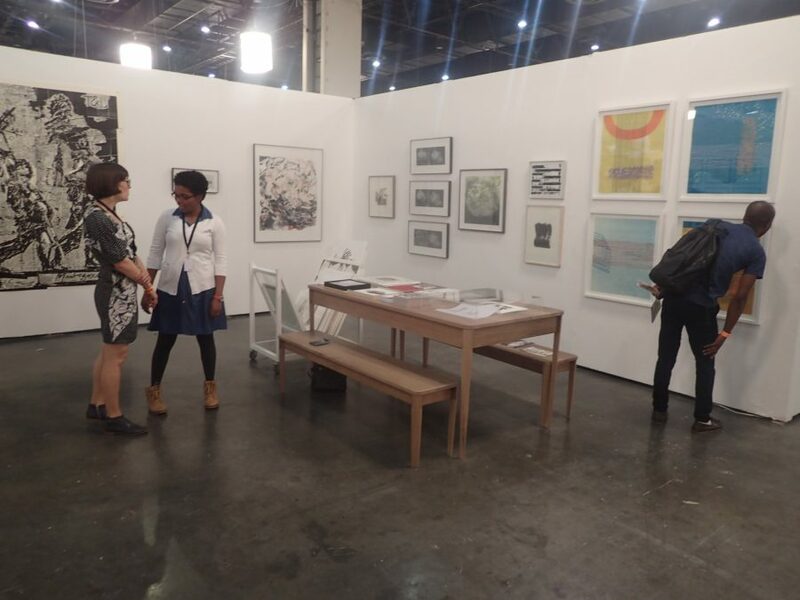 DKW master printer Jill Ross and Ngwenya at the DKW booth, where we showcased series’ of prints by Robyn Penn, Mongezi Ncaphayi, Matthew Hindley, William Kentridge, Stephen Hobbs and Jaco van Schalkwyk. 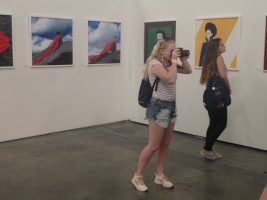 As the profiled artist of the fair, Aida Muluneh‘s booth got a lot of attention from collectors, press, artists and students. 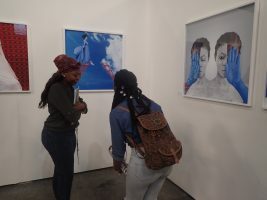 In addition to showing her work, Muluneh did a Ted talk and was interviewed by BBC Africa and Kaya FM. At our paintings booth, Congolese artist Thonton Kabeya was drawn to Endale Desalegn‘s striking expression of the paint material together with his monochrome palette and sparing use of colour. Artist Thonton Kabeya with Endale Desalegn’s On/Off (Mebrat/Metfat) 3, 2014, oil on canvas. 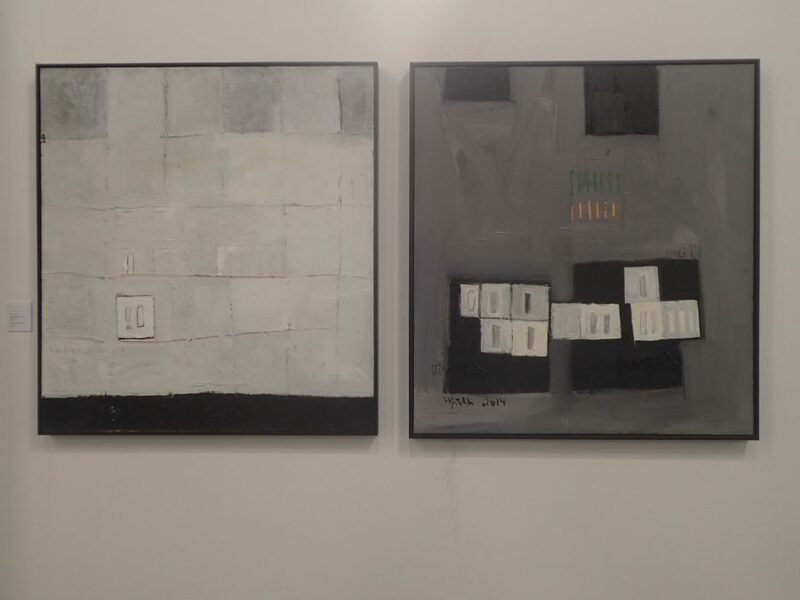 Endale Desalegn, On/Off (Mebrat/Metfat) 2 & 3, 2014, oil paint on canvas. 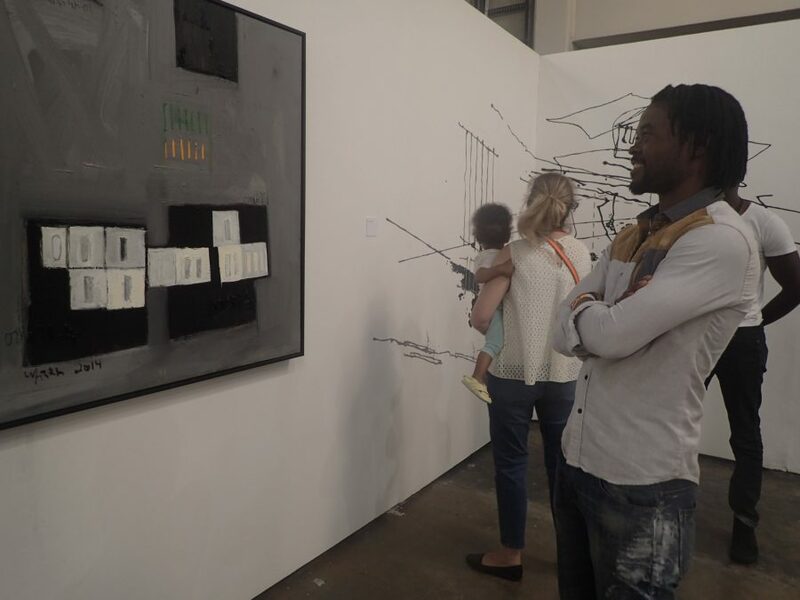 Some visitors kept returning to the booth to look at Lorenzo Nassimbeni‘s specially commissioned wall piece, Field, which broke the typical mould of framed painted works on canvas and was the only mural at the fair. 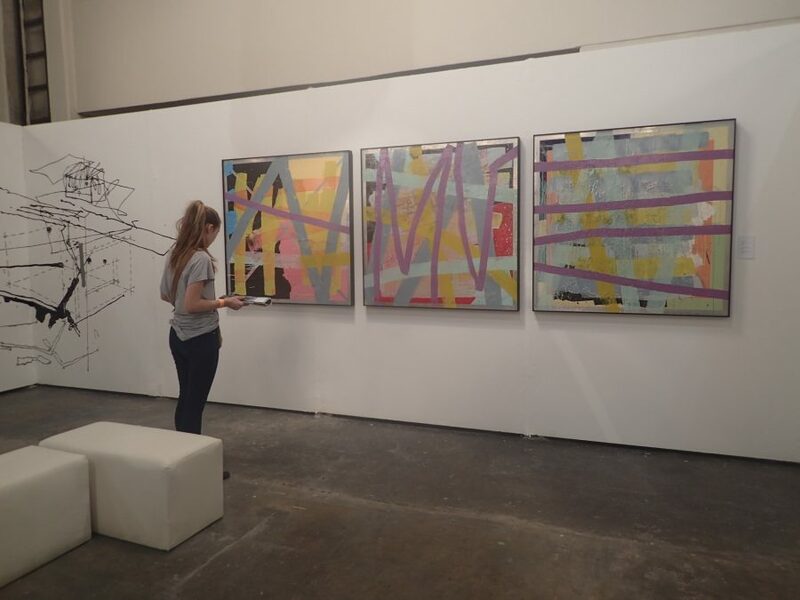 The composition of Field is derived from the geometric forms found on the surrounding artworks on the paintings booth to tie the space together through a subliminal sense of cohesiveness. 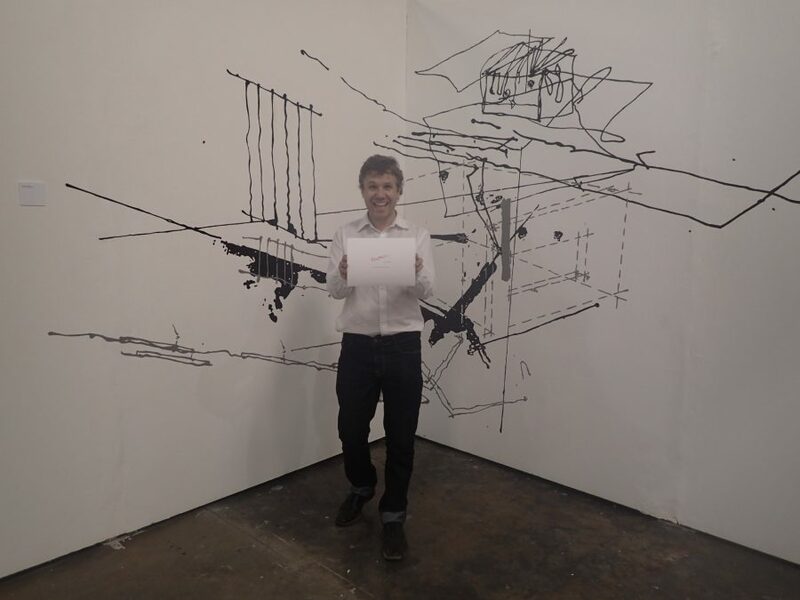 A six year old boy spent time analysing the works on our booth. He spoke with Nassimbeni about his interpretation of the crossover of architectural qualities found in the paintings and the mural, pointing to the shape of a building at the top of the mural and a parking lot at the bottom with oil spilling from the bottom. 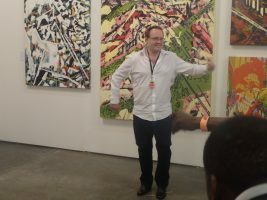 Nassimbeni explained that the oil-like lines were directly influenced by aspects of Quinten Edward Williams‘ featured paintings. We dedicated a wall of our booth to a series of new paintings by Quinten Edward Williams, collectively titled To break in upon (2016). 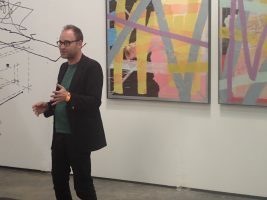 On Friday, Jacob van Schalkwyk and Williams did a talk about their unique approaches to painting. 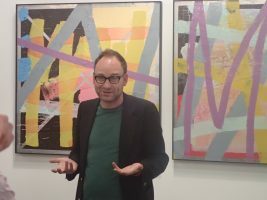 Van Schalkwyk discussed his intuitive way of working, whereby he has no agenda when he starts to paint: “With all the chaos going on in the world, I just go into my studio and I work,” he said. 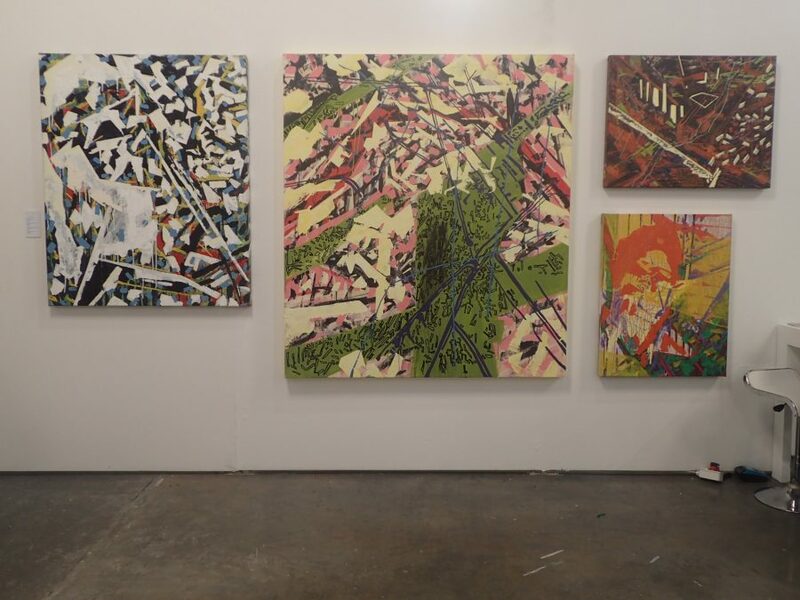 The artist described how he papered his studio from floor to ceiling and “just goes for it” to escape the limitations of the canvas, aka “the anxiety of the edge”, as he puts it. On display (left to right): Jacob van Schalkwyk, Allsorts, Sea Point Window, Woodstock Window, 2013-2016, lithographic ink on walnut oil on aluminium, unique works. 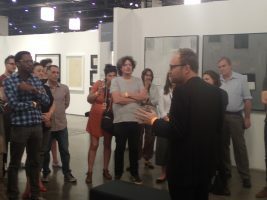 He invited the crowd to touch the paintings to get a full sense of the textures, explaining “I use texture to give a feel for the colour.” He spoke about the simple but highly effective Renaissance components to painting – oil, pigment, medium – to have influenced his approach to these works where he used walnut oil to give the paint a lustre and thickness. 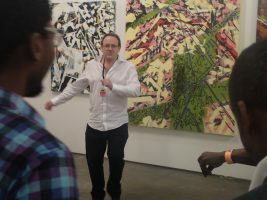 Williams began his talk by loosening up the crowd, getting everyone to freely move their bodies in the space before launching into a contemplation of the different ways in which he looks at his art – a process inextricably bound up with the body. 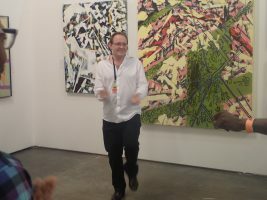 One mode of looking that Williams exercises in his studio is peering out the corner of his eye, which means taking in the surrounding space in which his artwork exists before returning to the canvas. Another way is through his “mind’s eye”, as he puts it, which means internally ruminating on the ideas and experiences, which, in turn, influences his painting. 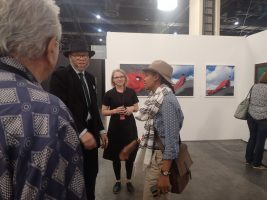 He finished off by encouraging the crowd to look at the art at the fair with this heightened awareness of sensation. DKP Paintings & Mural booth. All in all, it was a vibrant weekend filled with interesting conversations and encounters. Looking forward to JAF 2017! Click here to see the full range of works shown across our booths this year.